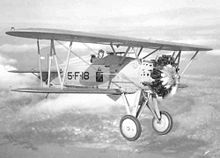 Boeing developed the aircraft as a private venture to replace the Boeing F3B and Boeing F2B with the United States Navythat was the first flight of the P-12 took place on June 25, 1928. The new aircraft was smaller, lighter and more agile than the ones it replaced but still used the Wasp engine of the F3B. This resulted in a higher top speed and overall better performance. As result of Navy evaluation 27 were ordered as the F4B-1, later evaluation by the United States Army Air Corps resulted in orders with the designation P-12. 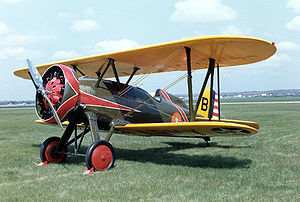 Boeing supplied the USAAC with 366 P-12's between 1929 and 1932. Production of all variants totalled 586. P-12s were flown by the 17th Pursuit Group (34th, 73rd, and 95th Pursuit Squadrons) at March Field, California, and the 20th Pursuit Group (55th, 77th and 79th Pursuit Squadrons) at Barksdale Field, Louisiana. Older P-12s were used by groups overseas: the 4th Composite Group (3rd Pursuit Squadron) in the Philippines, the 16th Pursuit Group (24th, 29th , 74th, and 79th Pursuit Squadrons) in the Canal Zone, and the 18th Pursuit Group (6th and 19th Pursuit Squadrons) in Hawaii. The P-12 remained in service with first-line pursuit groups until replaced by Boeing P-26s in 1934-35. Survivors were relegated to training duties until 1941, when most were grounded and assigned to mechanics's schools. Export version for Brazil with an F4B-3 fuselage and P-12E wings, 9 built. A surviving P-12E is on display at the National Museum of the United States Air Force at Wright-Patterson AFB near Dayton, Ohio. A Model 100E on display at Royal Thai Air Force Museum, Don Muang Royal Thai Air Force Base. Data from Bowers, 1989. pg.